Gardening day again, and it didn't even rain this morning. Although, I hope it rains tonight or tomorrow. 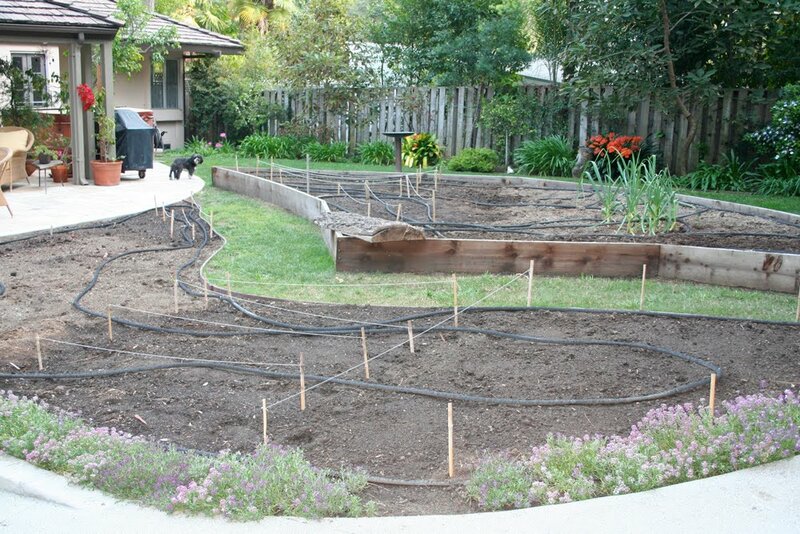 It will be so great for all the newly planted vegetable seeds and seedlings. Three people and myself worked in the garden today. We transplanted 5 cherry tomato seedlings and seven bell pepper plants into the gardens today. We planted radishes and broccoli. We added compost, mycorrhizal fungi, mulch and watered everything with Super Thrive. For the tomatoes I put in 2 Tbs of Tomatoes Alive in each hole before transplanting the cherry tomato. Sprayed everything, even flowers with Neem oil, which is a fungicide, insecticide and miticide. (2 tsp per gallon of water, foliar). Best to prevent infestations before they begin. However, in the herb garden I found leaf hoppers. It looked as if they had all just hatched or were about to. The Neem oil didn't seem to affect them, so I gave them a dose of Diatamaceous earth, that powder that kills insects. Let's see what happens in the next few days. Everything is starting to come up in the garden. I must admit that I'm excited. In the ground, there are peas, beans, turnips(only planted last week) and corn. In small pots-cherry tomatoes, bell peppers, zucchini and eggplant. It's still too soon to transplant the newly emerged seedlings. Maybe next week. Hoping to garden tomorrow, but the forecast is for rain. Great for all that's planted, but I have so much more to plant--broccoli, cauliflower, pak choi, radishes, potatoes. I even have worm castings to add to Garden #1. Those hungry voles ate my earthworms. Darn them! What a garden we're going to have this summer! Wow, did we work hard today! And we got so much done. First, Mazyar worked on the hillside, where I will soon be planting all the zucchini, squash, watermelon, cantaloupe and cucumbers. He mixed in gypsum (to improve the texture of the soil) and compost. Then we planted all the above vegetables in small containers to be placed on the heating mat, to be transplanted later. Nisha and Flora turned the large compost pile in my yard and then they, along with Juna, planted mache, salad bowl lettuce, royal oak leaf lettuce, beets, chard, turnips and carrots. Just puttered around the garden today. Didn't plant any more vegetables. I did feed the jasmine near the fountain and I watered everything. I put the cherry tomatoes in the sun today. It's so great to see the little seedlings and the blossoms on the fruit trees. So much to do, so little time! I planted French marigolds in between the tomato plants. Apparently, they attract aphids, so the aphids don't eat your tomatoes. Sounds good to me. Tore down the last of the tomato supports. They were so poorly constructed. Have to start all over. Pulled out the last of the arugula, red onions and most of the garlic. Still about 15 -20 garlic plants left. Planted 3 rows of carrots near the tomatoes in garden #1. Watered everything! Spring has sprung. The peas are coming up, as are the cherry tomatoes. Blossoms on the plum tree, orange tree and the avocado trees. Good day in the garden! Four people worked in the garden today: Juna, Mazyar, my daughter Lauren and myself. We got a lot done. Lauren & Juna worked on the fruit trees: plum, 2 avocado, 2 lemon, peach and orange. They added compost and fertilizer, and mixed it in well. Mazyar and I added compost to Garden #1, the west side, and planted 3 rows of Argent Sweet Corn. Then, we added 3 rows of beans (green beans, royal burgundy beans & Scarlet Emperor bean pole runners) next to the peas in the raised bed. I had planted alyssum along the north border of Garden # 1 and there were a few bald spots. We planted seed there. I like the alyssum because they attract beneficial insects. I will plant marigold flowers for a similar reason-they fight root-eating insects. We watered all the newly-seeded areas with water and Super Thrive. Tonight, I took my dog, Leelu, out and much to my surprise, saw the earth move in Garden #1. Gophers or voles! Damn, I thought I got rid of those. Oh well. So I sprayed both garden areas first with water, then witha mixture of castor oil & water, and then more water. Hopefully, that will take care of the problem. Gophers and voles hate castor oil. Two more pressing problems: I have to blow out the soaker hoses and rebuild the tomato supports. I have time for the tomato supports (the seedllngs haven't even appeared), but I need to start thinking about how I want to do it. I also bought a couple of fences for either the peas or the beans. Only Mazyar came to work in the garden today. I had already watered the strawberries and begun to fertilize the avocado tree when he arrived. I almost used a whole box on one tree. I will need about 3 more boxes at this rate. I asked Mazyar to add gypsum to the raised bed. First he wetted down the soil, then I spread a bout 3 lbs. of gypsum over the whole bed. Mazyar mixed it in well and then we watered again. Tomorrow I will plant the beans there. Yesterday I bought a bamboo fence for the peas. Can't wait to set it up. I may spray the nematodes on the gardens today. The season has begun. Not too much to do until now. There was a lot of rain and not that much growing. Every day will be important from now on. I watered all my newly planted seeds this morning. It was quite cold last night. I hope they will all be fine. I know the pots on the heating pad will be okay--but what about the poor little seeds in the ground. Time will tell. I added dolomite lime and compost to the raspberry plant. Forgot to do it last Wednesday. Also watered with Super Thrive and water, of course. Am working feverishly on the plan for the garden. Artists come this Saturday to plant more seeds. Where to put them all? The seeds, I mean. That is the question. 3 people came to work: Juna, Raksha & Ginger. First we added compost and dolomite lime to the strawberry beds on the lower hillside. We mixed it in well and watered it with Super Thrive. Then we planted 3 kinds of tomatoes in Garden #1. I moved the area for tomatoes to the east side, since I have been planting tomatoes on the north side for far too long. We planted Brandywine, Beefsteak and Roma seeds and watered with Super Thrive. 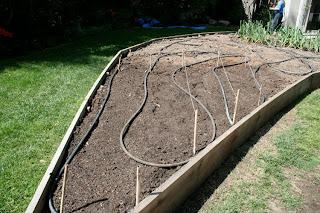 Then, we planted one row of Burpee peas and one row of Sugar Snap Peas behind it on the south side of the Raised Bed. I chose that spot because I had formerly cultivated chives and onions there and that is supposed to be good for future cultivation of peas. We set up the heating pad in a protected area behind the house and planted red and yellow bell peppers, jalapenos, eggplant and cherry tomatoes. The extra 10 degrees the heating pad will produce will help the seeds germinate. 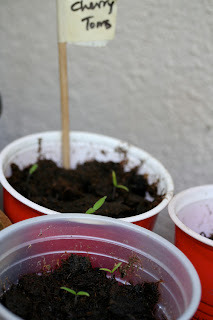 After the seedlings come up, I will transplant them into the garden. But where? That is my next project. Figuring out where to put the rest of the vegetables. I found out that Gardens Alive cannot ship Grub Away to California. I wonder what that is all about. Maybe it's not as organic or as safe as I thought it was. Meanwhile, part of my order from Gardens Alive arrived--lawn fertilizer, seeds, Escar-go. Still waiting for the beneficial Nematodes. They will arrive later this month. I worked in the garden for a while today. Decided where the tomatoes, corn, peas and beans will go. I marked out the spot for the tomatoes with small bamboo stakes. I also started taking down the large tomato support (the one closest to the studio). I will be planting corn there, so the support has to go. So, tomorrow we should harvest the last of the chives, garlic and red onions and some of the arugula (where the corn will be planted), pull out the large tomato support, add dolomite lime to the Raised Bed and Hillside gardens, plant tomatoes, corn, peas and beans directly in the ground, prepare the small containers with potting soil and plant all the peppers, set up the heating pads, turn the large compost bin. Wow, we have a lot to do. Sprayed Actinovate over all the gardens in preparation for the spring planting. I just ordered some Grub Away from Gardens Alive. Too many grubs in the gardens. 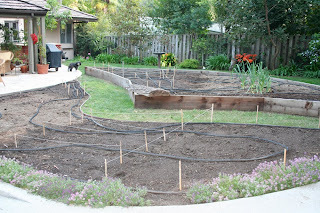 I will start planting next week--tomatoes, peas, beans. I plan on using the heating pads to start the peppers. Almost spring--can't believe it!